Nikolai Efimovich Timkov (12 August 1912, Rostov-on-Don, Russian Empire – 25 December 1993, Saint Petersburg, Russia). 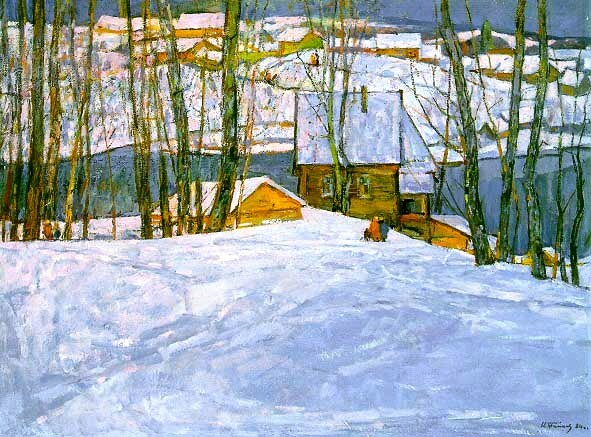 Nikolai Timkov often depicted winter. However, the painting above is a fine but very personal portrayal of winter. As we will see, it is reminiscent of the “lyrical landscapes” of nineteenth-century Russia. Moreover, it can be associated with impressionism, a French art movement that flourished during the last two decades of the nineteenth century. 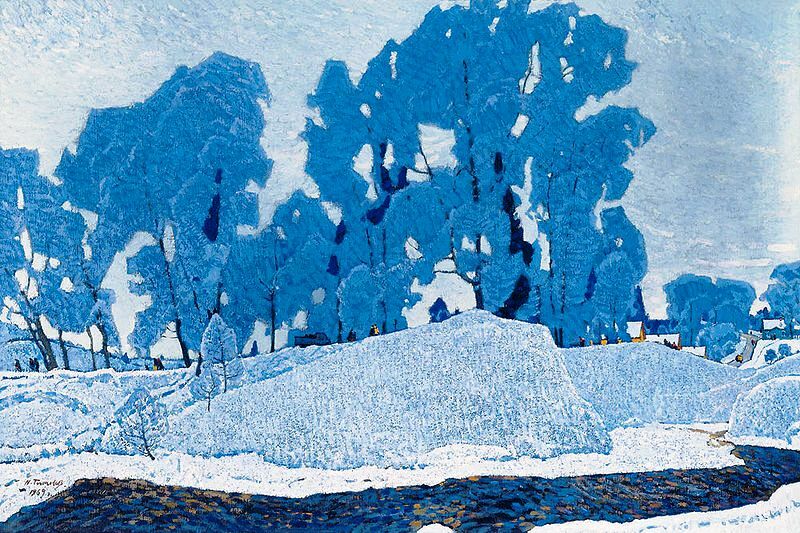 Yet, the creator of this winter landscape, Nikolai Timkov, is a twentieth-century artist, born at settlement of Nakhichevanskaya Dacha, close to Rostov-on-Don, in the Russian Empire. He studied art at the Repin Institute of Arts and graduated in 1939. Four years later, he became a member of the Leningrad Union of Artists (St Petersburg), beginning in 1943. Although Tomkin has explored other areas of painting, such as genre art, the portrayal of people engaged in everyday activity, he is known mainly for his lyrical landscapes. Alexei Savrasov (24 May 1830 – 8 October 1897) is the creator of this mellow style that also characterizes the art of Isaac Levitan‘s (30 August 1860 – 4 August 1900) mood landscape. So how is the above painting, by Timkov, a lyrical landscape? Well, Timkov has colored winter in a lyrical or poetical manner. For him winter is essentially blue. In this regard, “Russian Winter. Hoarfrost” resembles the paintings associated with impressionism, an art movement developed in France in the final decades of the nineteenth century. 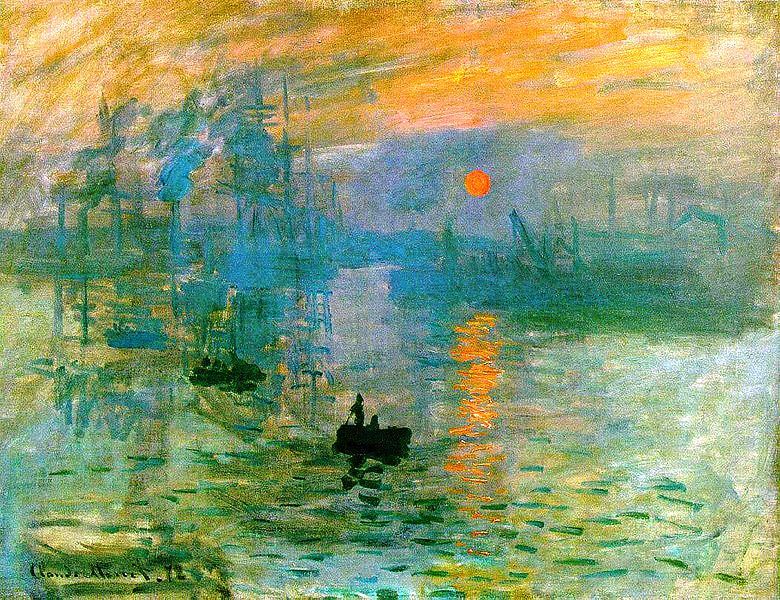 Impressionism was a French art movement, but it had considerable influence outside France. Its masters are Monet, Renoir, Degas, Pissaro, Manet, Sisler, Berthe Morisot, Marie Bracquemont, American-born Mary Cassat, etc. Starting with Cézanne, Gauguin and Van Gogh, who are labelled post-impressionists, paintings present distortions, but were otherwise precise. However, the goal of earlier impressionists was to convey the essence of the object or subject they depicted: landscapes, still lifes, persons, etc. Such a goal can lead to a more personal depiction of objects or subjects, but during the early years of the movement, works produced by impressionists were characterized by a degree of imprecision. They were impressions and “suggestions” of objects or subjects. But let us return to Timkov. Timkov provides us with mostly realistic paintings, i.e. the various components of his paintings are not impressions. 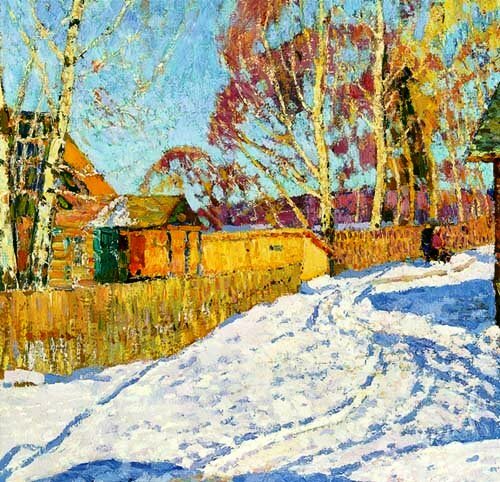 Yet, in one painting, Russian Winter. Hoarfrost, he has transformed a winter landscape into a study in blue, where details are a relatively secondary element. For instance, there are very few details to his trees. Timkov uses little black or indigo lines that “suggest” branches and give depth to the landscape. Moreover, to the right of the painting, we see roofs and houses. They are almost imperceptible unless one looks closely, but they “suggest” the presence of a village and, because they are small, they too give depth, or perspective, to the painting. As for the river, in the foreground, Timkov has used a very dark blue to carve it out of the canvas. This dark blue lends the painting a very firm and mostly horizontal base, except to the right, where the river bends in the direction of the village. There is texture to the river and to every component of the painting. The river, its shore or banks, the foliage of the tree, all combine a dark and paler shade of the same blue. This confers not only texture to the painting, but also dimensionality, particularly the trees. The same is true of the banks and the sky. Yet, this painting is mainly monochromatic: shades of blue, and it cannot be considered a truly realistic portrayal of winter. It is not foggy or blurry, but it is nevertheless an impression of winter and subjective. 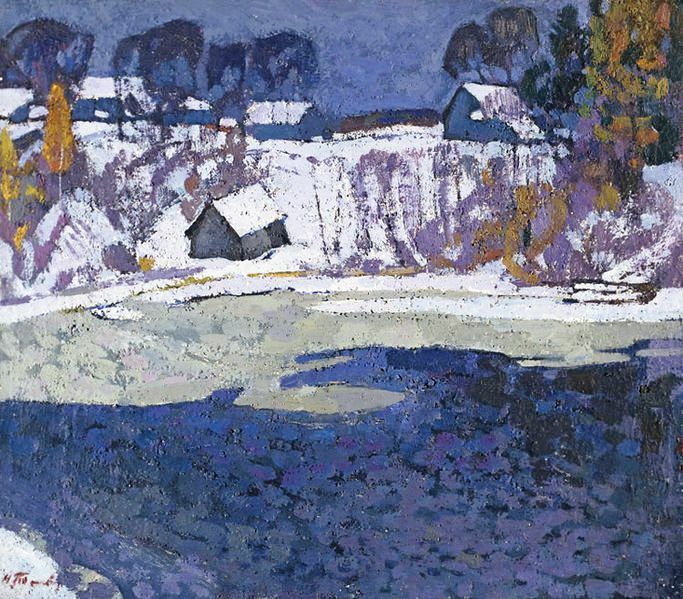 In this one painting, Timkov’s winter is essentially blue, which gives Russian Winter. Hoarfrost a certain intimacy. This is not winter; this is Timkov’s Russian winter. If the painting were realistic, a little blue would help shape the snow. But fir trees, the evergreens, would be green, and deciduous trees would not have foliage, which they do in Timkov’s painting, blue foliage. As a result, the painting is both representational: a landscape, and fanciful and poetical, or an impression of winter seen as essentially blue and, therefore, a subjective impression.